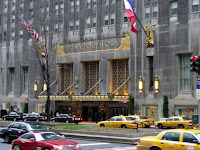 When Toni and I finally made it to NYC we hopped directly into a cab and headed to our hotel, the historical Waldorf Astoria. This hotel is typically rather pricey, but here is a great tip for future hotel booking. During popular visiting dates (Cherry Blossoms in DC, NYE in NYC, Ground Hog Day in Pa) purchase your room as a gift certificate. By doing this you will be given a better rate as well as really great service! Also, don't be afraid to tip. Toni and I had a rather tiny room booked that only had one full bed. By just cutting our morning Starbucks and hooking up the front desk guy with a "Jackson," we were then upgraded to a room with two double beds and an amazing view. This room would have cost us about 200 more dollars a night, and instead we just skipped our morning cup of franchised Joe! After Toni and I were nice and settled in, we set out on our first mission of the day...A HUGE GLASS OF WATER. I mean it when I say take water on the Chinatown Bus. 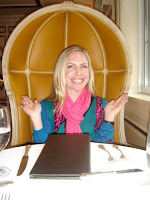 So, we headed straight over to our lunchtime destination...the restaurant in Bergdorf Goodman. It is an absolutely beautiful restaurant with a breath taking view of Central Park and these awesome dome chairs. It is a bit pricey and the portions are small, but it definitely is worth it for the view! 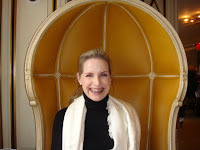 Here are some pics of my mom and me in our chairs! As all marathon runners know, HYDRATION is key to your success. This goes for window shopping success as well. Make sure to carry around a bottle or water with you. Also, if you are drinking alcohol at all your meals (as Toni and I were) don't forget to drink from your water glass as well. I know that it is easy to forget about that simple beverage when you have something tempting like a Mimosa sitting beside it, but trust me...it is worth it down the road. Unload your purse. Mine was still stuffed with all the last minute things I grabbed that morning (umbrella, my rescued IPOD, a book) that I had taken with me on the bus...thus super heavy. My shoulder was killing me because of all the weight and led to more irritability. If it is cold outside make sure to wear clothes that are layered. I would be freezing outside but the second I got inside a store I would be sweating my face off. The stores must have been trying to push their summer merchandise by making the store feel like Falfurrias, Texas in July! Thus wear stuff you can take off while shopping and put back on to brave the frigid outside air. You should be a travel writer! Yall are presh.